Purpose: This study mapped the localization of regional nodal recurrence to determine whether the clinical target volume (CTV) should be redefined in adjuvant radiotherapy. Patients and methods: Between January 2004 and October 2015, a total of 129 patients with gastric cancer following D2 resection who experienced regional recurrence were retrospectively examined. The lymph nodes (LNs) were hand-drawn proportionally on template computed tomography (CT) images of a standard patient by referencing surrounding anatomic landmarks. The association between clinicopathologic factors and LNs at risk was further investigated. 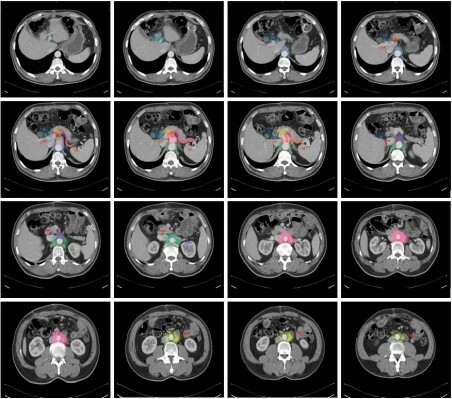 Results: Based on the contour of the recurrent LNs, the authors observed high-risk regions for relapse and drew a density distribution map of 16 LN stations on the CT images. The most commonly involved recurrent LNs were stations 16b (51.2%) and 16a (39.5%). Stations 13, 12, 9, and 14 were involved in 36.4%, 33.3%, 28.7%, and 27.9% of recurrences, respectively. Other regions, including stations 1–6 (perigastric LNs) and station 10 (splenic hilar LN), were of low risk. Notably, 72% (83/116) of recurrent 16b LNs were located in the upper half of 16b1. Analysis within subgroups showed that the pathologic N stage was the only independent risk factor for LN 16 relapse. Conclusion: This mapping suggests a new method for vessel-guided delineation of regional LNs when defining the CTV in patients after standard D2 resection. LNs around the abdominal aorta and its main branches, as well as regions around the hepatic hilar area and pancreatic head, should be the most important radiotherapeutic targets.